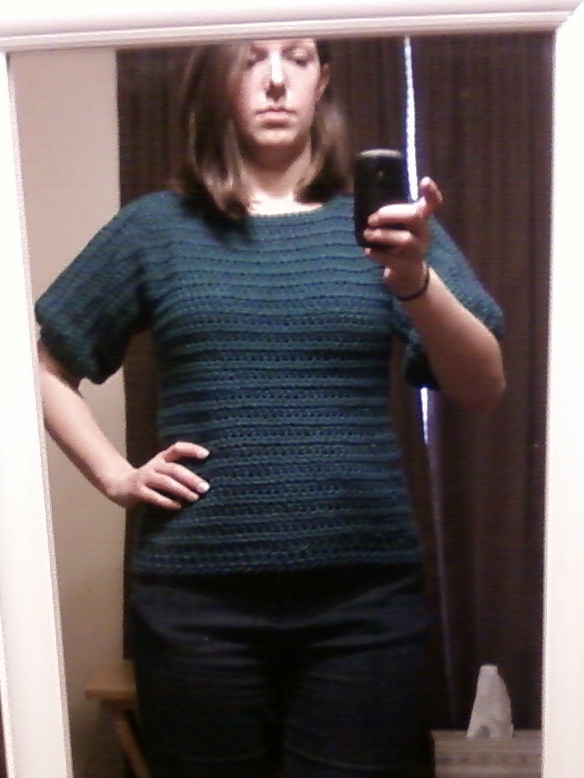 …i crocheted my first sweater! i am not altogether thrilled with the result, but i think it’s decent for a first attempt. it is a slightly modified version of the cozy classic pullover pattern from the lion brand website. the pattern called for homespun, but almost immediately after starting, i remember just how much i detest homespun yarn. i don’t know how other people use the stuff – i can never see my stitches. for a sweater, when counting and symmetry matter, i just couldn’t handle it. so i bought some bernat softee chunky in teal, instead. unfortunately, this yarn is a bit more stiff and doesn’t have the same drape as homespun, so the pattern didn’t quite work as i had hoped. the sleeves looked like stovepipes! so one of the modifications i made was to cinch the sleeves. i also didn’t do the same finishing they recommended on the bottom of the sweater and the neckline. drape matters. if using a different yarn than is originally called for in the pattern, find one as close to the texture of the recommended yarn as possible. trust your instincts. if when making the pattern, something doesn’t seem quite right, figure it out then and adapt, if necessary. i thought the sleeves were way too short, but trusted the pattern and continued on. turns out, they were too short. i didn’t have the heart to frog it, so i am just living with it. after all crocheting was complete – time to sew it up! the finished product; not perfect, but not too shabby for a first attempt! 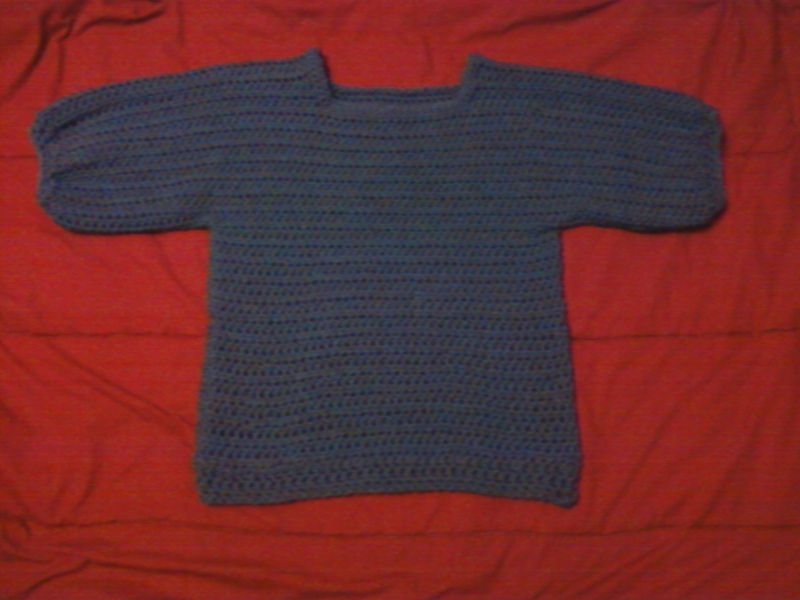 This entry was posted in Crochet and tagged crochet, sweater. Bookmark the permalink. please ignor opms What do you mean by "frog" Couldn't you add on after your done? Thanks Barbara! I could add on to make it longer but I used up all the yarn and I didn't want to buy another skein since I was already not very happy with it. Frogging is ripping out…it's a play on the words "rip it…rip it…" I figured if I ever feel like it, I can always buy more and add to it but I already didn't like the fit so it just wasn't worth it to me. I did use the same hook size they recommended and my gauge was right on, but the sleeves are definitely supposed to be longer based on the photo. What's strange is that you mostly measure as you go along in the pattern – so the sleeves ARE correct based on the measurement…so that was a little confusing. I would like to try it again with a different yarn but I still can't bring myself to do Homespun! Wow, you really don't like it? I think it looks great. I'm planning on making that sweater, because I loved the picture on the LB website, and now that I've seen yours, I really want to make it! Well thank you!!! I just don't like how it fits at all. In this photo it does actually look ok, but it is just really boxy and doesn't drape/move very well for actual wear. I do really like the pattern though, so I would love to try it again with a different yarn (or maybe even Homespun again…we'll see). Good luck, and my advice is to just make sure you get a yarn that moves well! I've never used Homespun yarn, that's what the pattern calls for. Does it drape well? 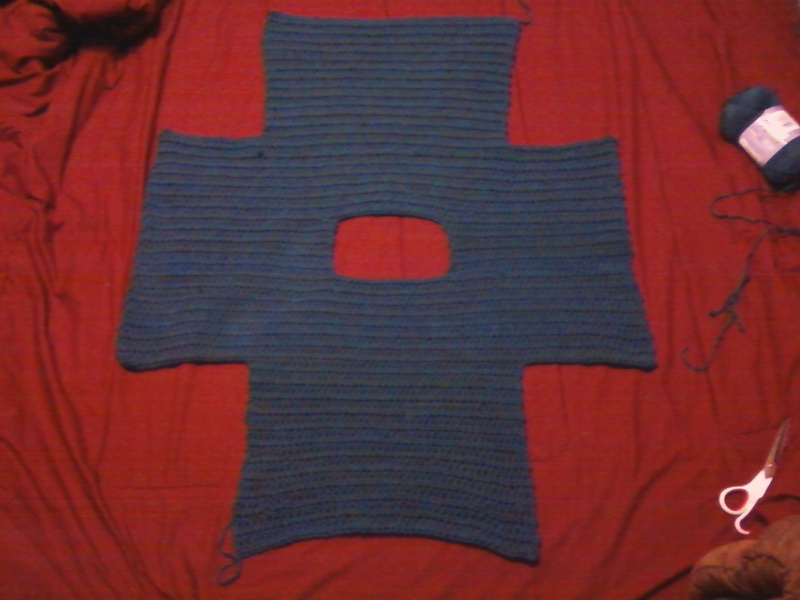 I have tried making some things out of Homespun, and the stitch just disappears into the yarn pattern/texture. So pick patterns with no fancy stitches at all. What I did to handle this was to take some smooth-finish baby yarn (used pink because that was what I had), and for every chain I made, I wove the pink through it. Then if there was a stitch count, I wove the pink around the stitches that marked the end/beginning of the pattern stitch, or just every 10 stitches, depending on the pattern. When I made a hat, I worked in the round, and had 2 pieces of pink, 1 going up the hat at the start/end stitch, and 1 that I wove in around every 10th stitch or on the increase/decrease stitch on the round. It really did help. When I was sure I was finished, I just pulled the baby yarn out. The hat so soft and warm. It is also floppy! I also made a hooded scarf out of the same yarn. I found I needed the baby yarn woven through each stitch along the outside edge where I had to sew/join sides together. Hope this idea helps. It would look really fabulous with a wide black belt at the waist!